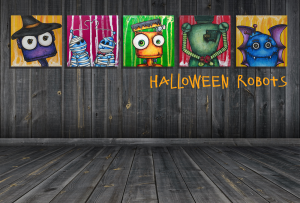 Our beloved robots are back, but this time they are bigger and ready for Halloween! Each robot has turned into their own spooky character for the upcoming holiday. Created on Canson artist paper with coloured pencil and mounted on canvas, they measure 6″ x 6″ and are $40 each. Greeting cards are finishing up at the printers and will be available shortly. Each package will contain five different cards and will be available for purchase at $15. “Meet the Makers” Birthday Love for Lakefield Animal Welfare Society.